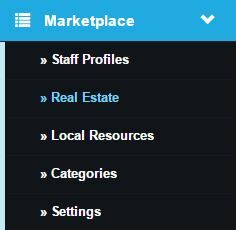 The Marketplace allows you to create and manage various listings such as real estate listings, staff profiles, local resources, and more. To create a listing, click on the Marketplace tab in your website and select the type of listing you would like to create. In this article we will create a real estate listing. Each listing section will display a list of all of your current listings of that type. From here you can create new listings, edit or delete your existing listings, publish listings, update category information, and update your Marketplace Widget Options. You can change the title of a listing or update the categories for a listing directly from the overview page by clicking on the blue text in each column. Changing the Title will also change the URL that is automatically created for the listing. Click the blue button to save your changes. To make edits to multiple listings at once, select the listings you wish to edit by clicking in the check box next to each listing. Once a listing has been selected, it will be highlighted in red. You will also notice that the Publish Listings, Edit, and Delete (Trash Can) buttons are now highlight and able to be used. 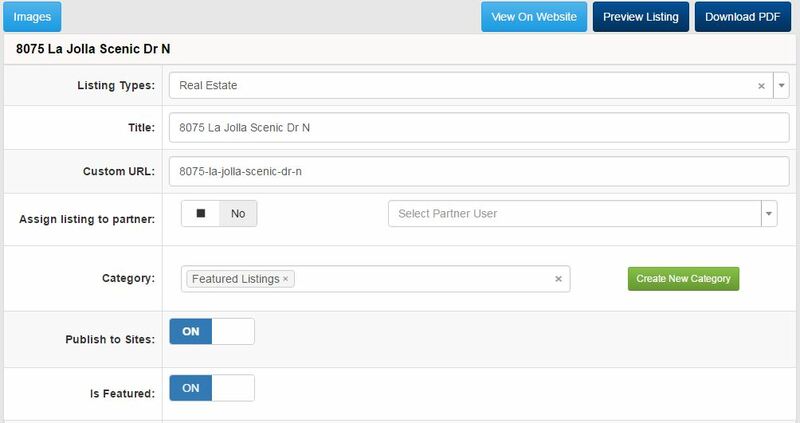 The Edit (Pencil) button allows you to change the categories or set "Featured" to ON for multiple listings at once. To create a new listing, click the create button at the top of the Listings Overview page. To edit a listing, click the Edit button under the Actions column. For this example, we will edit an existing listing to show additional options. The first section when creating a new listing includes standard fields that pertain to all listing types. The title will be reflected on both the preview and the listing itself and will be used to identify your listing throughout the admin panel. The Custom URL will automatically be generated using the title that you enter. Listings can be assigned to a Partner if you have given access to any individuals through the Partner System. Each listing can be assigned to a category or multiple categories depending on how you choose to organize your listings. If you would like to create a new category for the listing you are adding, click the Create New Category button. Listings can be created at any time but will not appear on your website until they are published. To publish a listing at the time of creation, toggle the Publish To Sites button to On. Listings can also be Featured Listings. Only Featured Listings can be added to the Featured Listings widget on your website. Toggle the Is Featured button to On if you would like a listing to be available for use in the Featured Listings widget. The fields that follow the standard fields above will be fields unique to the type of listing you are adding. In our example we are adding a real estate listing so this includes fields such as the number of beds and baths in the home. If you would like to add additional fields or edit the existing fields, please contact our customer service team. Google Maps can be embedded in each listing. For this feature to function, you will need to provide the Google Maps API key from your Google account. To add the API key, please contact the customer service team for support. You can also embed one of the lead capture tools available on your website so that clients can contact you directly from the Listing page. Social Media Share buttons can be added to make it easy for clients to share your listings on their Social Media sites as well. 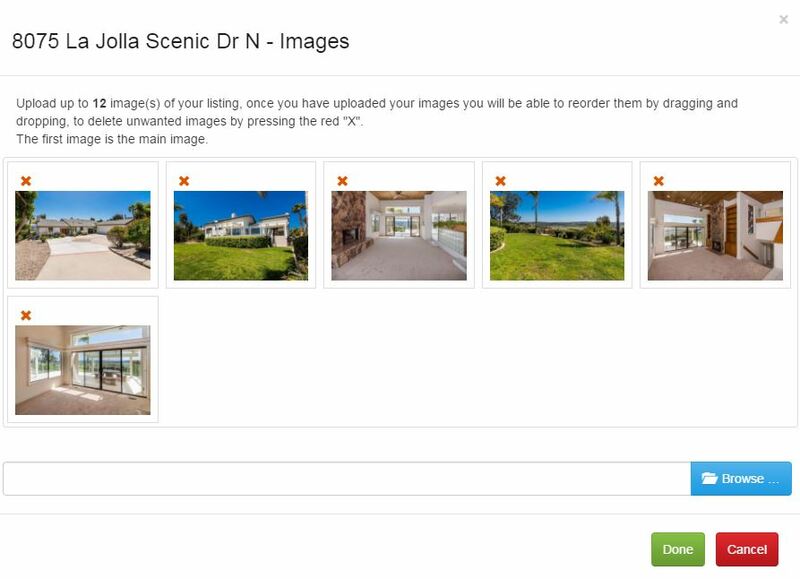 Up to 12 images can be uploaded for each listing by clicking the Select button next to Add Images. 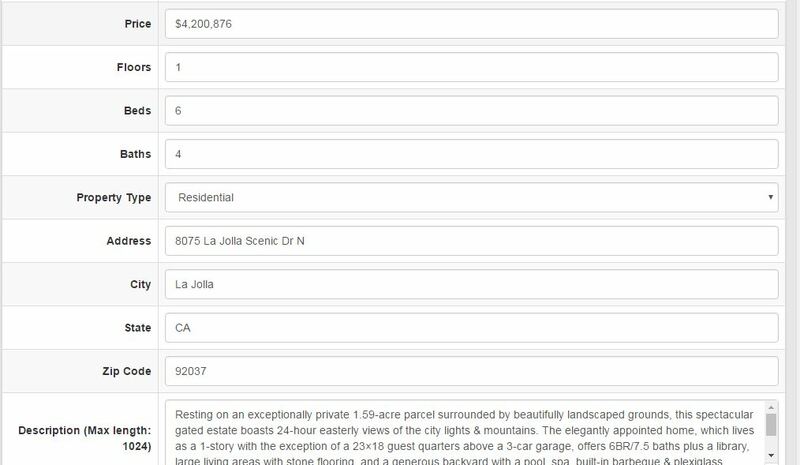 The primary image used in listing previews, and the featured listings widget will the first image in your list of images. To change which image is the primary image, drag and drop a new image into the first position.